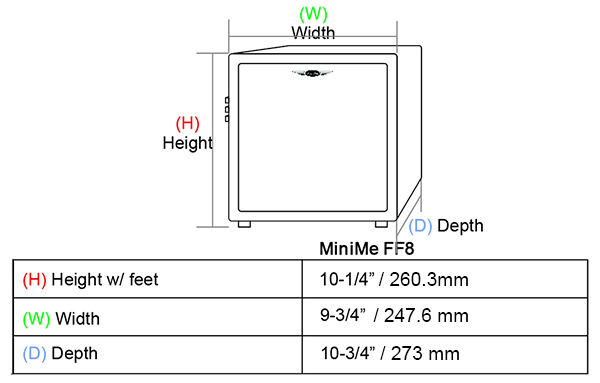 With the introduction of MiniMe-FF8-V2 (Front Firing) there is now a high performance subwoofer that can be placed without concern for bass port or passive device. FF8-V2 is built in a pressure chamber housing and can be placed in a corner or a cut-in in the wall. Closed cabinet design put great demands on the cabinet. 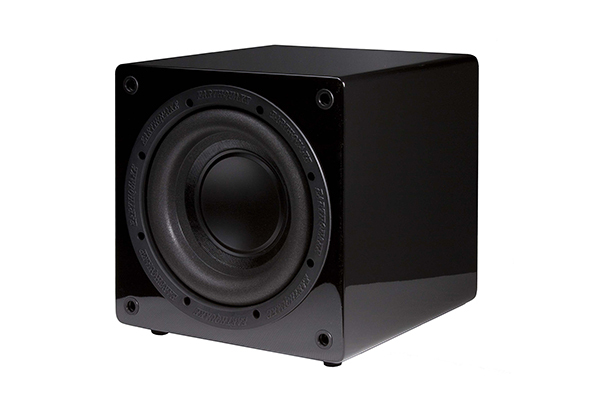 Both the cabinet woofer and amplifier must be dimensioned to operate in a high pressure environment. FF8-V2 is equipped with an over sized Earthquake High EMF XLT (xtra long throw) woofer to ensure powerful and pulsed output. The cabinet is solidly constructed of solid 22mm MDF, this powerful design guarantees high sound quality and long life even with hard use. The MiniMe V2 is covered in deep luxurious black piano lacquer. The cabinet finish begins with a thorough sanding and priming followed by multiple applications of black lacquer with additional fine sanding between layers. The cabinet is then finished with a smooth, high gloss clear coat. The elegant piano lacquer complements its compact modern design and in a sculptural way adds finesse and exclusivity to your home. MiniMe-FF8-V2 is equipped with an over sized 320-watt Class D amplifier. The advanced Class D technology has an efficiency of 90% which means that the amplifier does not get hot even with hard and continuous operation. Earthquake's unique Evolved Class D design is distinguished by high performance and superb bass control. Even the most complex source material is reproduced articulate and precise. 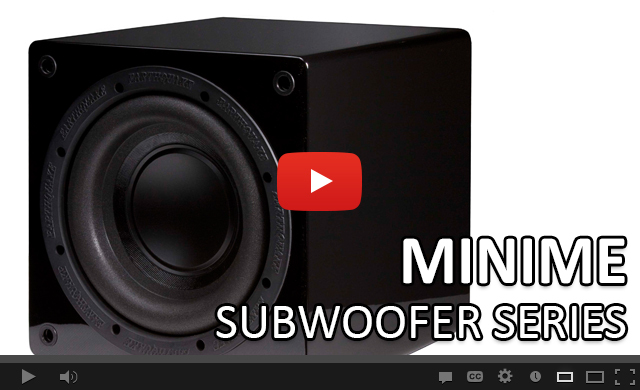 The XLT (Xtra Long Throw) woofer in MiniMe effectively translates electrical energy into movement. The strong mechanical design is the result of radical over dimensioning of all components. The XLT motor structure allows extreme movement, without physical deformation or reduced reactive electromagnetic coupling. The strong reactive electromagnetic coupling ensures that the device remains compression less and the very mobile suspension will not slow it mechanically. The intelligent and robust design means that the woofer is always electrically controlled by the amplifier. The result is superior transient response and dynamics. Detailed information on the built-in ME320-V2 amplifier.